Believe it or not, tooth enamel is the toughest layer that your body has. It’s here to protect teeth from damage from typical dental wear and tear like chomping, biting, crunching, and grinding. This protective layer also acts as an insulator to protect your teeth from hot, cold, and acidic substances. Without strong tooth enamel, your smile would be subject to a number of dental problems. Your dentist in Ocala wants to explore the depths of tooth enamel so that patients can truly understand why it’s so important to preserve it. When you view a diagram of your teeth, you’ll see several layers—the outermost being your tooth enamel. The enamel that covers your teeth is composed of tiny, tightly packed rods of minerals. Each of these rods are comprised of literally millions of carbonated hydroxyapatite crystals that created the strong bond that protects your teeth. Little do many patients know, brushing your teeth from side to side actually weakens your tooth enamel. That’s why your dentist always recommends brushing your teeth in a circular motion! To avoid dental problems like sensitivity and tooth decay, there are a few things that you can do to care for your tooth enamel and protect it from erosion. 1. Watch what you eat and drink. Foods containing high sugar, starch, and acid are horrible for your teeth and attack your tooth enamel. The best recommendation that a dentist can give you is to cut back on these types of foods and drinks. Instead, try drinking and eating calcium-rich substances to help neutralize acids in your mouth and strengthen your tooth enamel. Some of the best foods and drinks for this can be found in dairy products and dark, leafy greens. It’s never fun to have a chronically dry mouth, but this condition also damages your tooth enamel. By drinking water more often, your body is naturally producing more saliva which contains natural antimicrobial agents. Saliva helps to protect teeth against bacteria and contains calcium and phosphate to strengthen tooth enamel. 3. Brush and floss the proper way. 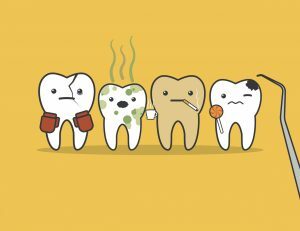 Everyone knows that if you don’t brush your teeth, you can expect dental problems in the future. When you avoid brushing and flossing, food particles and other dangerous dental debris sit on your teeth and erode your tooth enamel. Regular brushing and flossing rid the mouth of these harmful materials. Just be sure to treat your brushing as a massage for your teeth and gums rather than scarping your teeth. This can also damage your enamel overtime. Regular dental checkups and cleanings are a critical part to maintaining great oral health and keeping your teeth strong. If your dentist notices a problem with your tooth enamel, you can get help for it right then! As a master in the International Congress of Oral Implantologists, Dr. Weldon has seen smiles at every stage. From healthy, sturdy smiles with strong tooth enamel to weakened smiles that even need tooth replacements, he can’t stress how important it is to care for your enamel. If you would like to schedule an appointment with Dr. Weldon, give our office a call by dialing (352) 509-5761.